How's things in France? Did you get your license and a bike yet? I'd like it if you would add me to your mail list so I could get updates from France. I have a couple of questions for you about the G/S. Last winter BMW of Denver replaced my driveshaft and replaced some of the seals at the same time. I trailered the bike home and immediately took the heads off and sent them to CC Products. 6 weeks later when I got the heads back I put everything back together and took it for a ride. About 15 miles from home the gearbox started making a whining noise in 3rd gear so I headed straight for home and checked it out. There was no oil in the gearbox!!! They had forgotten to put oil in after the work they had done, but the drain and fill plugs were nice and tight! I called them up and asked them what the hell was going on. They apologized and offered to replace anything that was wrong, but said that there probably wasn't any damage since I had only ridden about 30 miles and "BMW gearboxes are really tough". They told me to ride it for 500 miles and drain the oil and check it out. Then ride it some more and see if there was any noticeable problems. That's what I did and there didn't seem to be noticeable problems. Now Clem at BMW of Denver is trying to convince me that it would be a good idea to check out the gearbox before I take the bike to South America, regardless of operating it with no oil. He says 5th gear often wears and needs attention and it would be a good idea to check it out. I'm worried about the bearings being scored from operating with no oil. What do you think about this? Do you think I did any serious damage to the bike riding 30 miles with no gearbox oil? Do you think it's a good idea to have it looked at before I leave? Have you ever done any work on the gearbox or is it completely stock? Also, I've got some slight leaking from the timing cover crank or camshaft seal. You told me that it was easy to replace these seals so I'm going to go ahead and do it. I have the rotor puller tool, and I need to get the seals and gasket from BMW of Denver. I think I'll also replace the rotor with a remanufactured unit from Motorrad Elektrik while I'm in there, and carry the original as a spare. Any tricks to this, or things I should look out for? Thanks for any advice. I hope spring is going well in France. Talk to you later. P.S. I got some email a couple days ago from Robert Runyard, the fellow you hooked me up with last year who was going to Chile for several weeks. He's back now and it sounds like he had a good time. He was telling me a little about his trip and asking about mine. He thought I was back already, but I told him I wasn't leaving until the end of the year. He sent me some images from the trip that looked pretty spectacular and really got me excited. I recently returned from 8 weeks in South America on the G/S. It was quite an adventure! I did almost 10,000 miles on some very bad roads and altitudes above 16,000 feet in places! The bike held up exceptionally well except for a few small problems, minor fork seal leak (plus some leaking out the top of the fork tubes - seems to be an inherent problem with that bike), broken front turn signal mount, dented front rim, and a broken luggage mount (I got it welded for $4!). After 3 days of bad dirt roads in Argentina the bike developed a rattle in the front of the engine that changed with RPM. I thought it could be the timing chain tensioner so I removed the timing cover to check it out but when I got in there everything was fine. When I was putting it back together I broke the winding on the stator and had to have that repaired. It took me a day to find someone to repair it but it held up for 8,000 miles and the rest of the trip. It took me a month to figure out that the rattle was a loose header exhaust nut allowing the header pipe to vibrate! I still feel pretty foolish about that. I was carrying a spare rotor, diode board, and ignition control unit but I never needed any of them. So, the only real problem was my own fault. Not too bad for an "old" airhead, huh? As soon as I get it back I've got lots of work to get it back in shape. I included a picture I scanned from Tierra del Fuego. I'll bet you don't even recognize the bike! I'll scan a better picture of the bike sometime and let you know more about the trip if you're interested. I hope things are going well in France. P.S. Your buddy Robert Runyard was a big help in planning my trip. We exchanged lots of email and he had lots of advice for me. It turns out that he was even in Chile while I was there but we weren't able to hook up. We're going to try to get together sometime and talk about our adventures. Thanks for hooking me up with him. Here is the initial report from Story Leavesley, of Boulder, on his plan for 2 months in South America on a BMW R80 GS he bought from a recent acquaintance of mine who now lives in Grenoble, France and pilots a BMW F650. Story's email address is shown below and I am sure that he would not mind email awaiting him when he finally gets online down there. You can ask to get on his distribution of email trip reports. Well I'm about to start my adventure in South America soon. You're getting this email because you expressed some interest in receiving periodic updates from me while I'm on the road. I'm composing and sending this email on my handheld Palm III computer. It's a little difficult to compose long emails but I hope to be able to send back some email from SA - not much but enough to let you know what I'm up to. My bike left Boulder near the end of October and it sailed out of Long Beach last week. I fly from DIA to Miami then to Santiago on 11/24, hopefully to be reunited with my bike! I spent much of my time during the summer/fall preparing my bike, getting my gear together, and studying my Spanish. I didn't get as far in any of those areas as I hoped but I figure I'm about as ready as I'm going to be. This trip has taken more preparation than anything I've done in my life - I hope it pays off. The first month in SA I'm heading south to Patagonia and Tierra del Fuego, up to Buenos Aires, then back to Santiago. The second month I'm heading north to Peru, Cusco, Machu Picchu, La Paz, then back to Santiago. All told I figure about 10-12K miles. I'll be flying back to Denver on 1/23/99. I have a daily itinerary that I will send to any of you that are interested in following my journey more closely. Please send some email to this account while I'm gone. Assuming I can get online I'd love to hear what's going on back home, and I will keep you informed of my travels. Adios for now. Talk to you from SA! Sometime last year I forwarded a couple of trip reports from a dual-sporting Boulder (CO) lad who headed for South America on a BMW R80 GS he had delivered to Santiago, Chile. He was unable to send all of his trip reports until recently, and I have consolidated them in the following text. It may be of interest to KLR650 listers and others, hence the distribution. I avoided most temptations to correct the spelling and place names provided by this fellow (Story Leavesley) and the reports did not have individual dates. It's a lot of text -- don't know how this would work as a single entry on the KLR list, or if some other forum might be appropriate. If the formatting of included material doesn't work on your system, I can forward an attached file. BTW, I will be posting some photos of several of the places he mentions, since I was in most of the same Chilean locations within the last two years. Well my first day in Santiago has been nothing if not - insane! My flights to Miami and Santiago were without incident, but I was unable to sleep on the long overnight flight into Santiago so I was pretty much a zombie by the time I got here. All of my sluggishness was soon exorcised by the white-knuckle shuttle ride from the airport. Traffic is very heavy and drivers have little regard for traffic lanes. It's definitely going to be a challenge when I get my bike. Speaking of which, that was my second order of business after hooking up with Mark at the Hotel Paris. I called my shipping agent and asked her how things were going, only to hear the fateful words - "there are some problems". So I went over to her office to hear the bad news. When I got there I was told that my agent in Denver never made the appropriate arrangements before shipping the bike, so the paperwork to clear customs wasn't started and there were still missing documents! Their best guess was that it would take a week to get the bike. Welcome to Chile! After some cajoling, lots of running around, and 3 hours, my agent came bike in and said that they discovered another way to clear the bike as tourist goods. I'm going out to San Antonio to try to get the paperwork completed and I might even have the bike by Friday. Mark was having similar issues clearing his bike but things look good for him to get his bike tomorrow! Aside from all that chaos, we stopped in the Centre district for lunch. While we were there, there were several protests going on over the recent Pinochet developments. Soon the Police moved in and broke up the crowd with tear gas and water canons. It was a little hard to eat lunch with the crowds scattering outside and the teargas stinging our eyes. Many of the shops closed for a while, but people didn't seem too shocked. Yes, I'm not in Boulder anymore! I hope everything goes smoothly tomorrow with the bikes and we can get out of this huge, intimidating city and into the more scenic parts of Chile. Hello from beautiful Los Angelos, Chile! We've been very busy the past two days, but the good news is that we've got our bikes! After my crazy first day, Thursday (Thanksgiving) was actually quite productive. We were up early and waiting at the curb at 9 for our ride to San Antonia. An hour later he finally showed up - on foot. We took the subway and bus to San Antonio and immediately went to my customs agency. My agents went into a flurry of action as soon as we arrived, phone calls, faxes, much excitement. Mark's agent spoke a little English and did some translating for us. He also asked my agents to clear Mark's bike along with mine. We all piled into a pickup truck and went to the first customs building. After much discussion and explanation we got some paperwork and were sent to the next building several blocks away. Again we had to explain our mission, and were greeted with looks of dismay and comments about crazy gringos. More stamps and more papers and back to the first building for more of the same. After this it was lunchtime and everything closed until 3 (better get used to it!). After lunch we went back to the first building where we got our final papers and stamps and then headed out to the warehouse where the bikes were. After more papers and stamps we finally paid the fee - $40 for storage of my bike for 8 days - and went to locate the bikes in the warehouse, which we did quite easily. Signed the final papers and we were done and back in Santiago shortly after 9. A long day but we had accomplished our goal of clearing our bikes. The bikes were supposed to be delivered to Santiago around noon the next day so I called at 10 to see if there was any news. Nothing yet, call back at 3 after lunch (!). There was still no news at 3 but she said she would call as soon as she knew. At 6 (on Friday) I called her back. She was just about to call to tell us that a cab would pick us up in 10 minutes to take us to the bikes. We got out there (someone's garage) and uncrated the bikes. They were in great shape and I don't think customs had ever opened them. The tires were a little low on air but each bike fired right up after a little gas was added. We rode them back to the hotel and parked them covered on the sidewalk. Today, we actually rode in Chile! It took us a couple of hours to clear the traffic in Santiago but we finally reached open farmlands with the Andes to the left. We stopped at a B&B kind of place here in Los Angelos, described as a Garden of Eden in the SA Handbook. This place is paradise! It's run by a German couple who built it after moving here several years ago. There are flowers everywhere, vegetable gardens, dogs, chickens. We had a group dinner with a Dutch couple who are finishing their trip next week after spending 6 months traveling through Mexico, Central America, and South America, a German gentleman, and the owners. They cooked us fresh food and we had fun drinking Chilean wine and talking about all of our adventures. What a pleasant change from the hectic bustle of Santiago - much more to my liking. Right now I'm on the ferry from Quellon on the island of Chiloe to Chaiten and the Carretera Austral. It's a five-hour ferry so I've got some time to compose email but I don't know if I can even send it. A couple of days ago while in Villarica I tried to send some email. My calling card worked perfectly and I got my ISP's server but my modem wouldn't pick up the line. I don't know what the problem was but I'll try again somewhere else. I'm afraid the phones down here may not accommodate my modem. The last few days we've ridden relatively few miles but the scenery has gotten more beautiful. We rode to the town of Villarica and got some photos of the active volcano. Mark did a little work on his luggage bolts which had worked loose and I explored the town. We stayed at a backpacker's hotel run by a couple who had bicycled around the world! They were interested in our trip and we talked a little about biking in various places. The next day we rode a couple hundred miles to Puerto Montt and booked this ferry from Chiloe to Chaiten. We stayed in another small backpacker's hotel not as nice as the previous ones. These backpacker hotels are usually just some rooms in the family's home. Sometimes you even share their kitchen and bathrooms. The owners are always helpful and it gives you a feel (although slightly skewed) about how the people live here. Yesterday we got up early and caught the short ferry onto Chiloe. We headed south to the middle of the island and took a dirt road to the beaches on the west side. The road was very bad in places with lots of potholes and washboard, and it started to rain as soon as we started down the dirt. On top of that, they were doing some road repair and they had dumped truckloads of sand onto the road. In places the wet sand was 6-8 inches deep which was very difficult on the heavily loaded BMWs, but we both managed to make it out with only a few heart-pounding moments. Towards the end of the road we came to a large river where they were repairing or building a bridge. The only way across was by boat and a fellow offered to take us across in his small boat but I wasn't going to risk my bike in that thing so we turned around and rode back to Chonchi for the night. The backpacker's hotel we stayed in last night looked like an old inn with large rooms, 10-foot ceilings, and a private bathroom. There were about 6 guestrooms but we were the only guests. It's still early in the tourist season but I wonder how these people can stay in business when we only paid $20 for the two of us for the night. Most things are not that much cheaper here either. We pay about $5-$10 for a simple dinner, a cerveza is $1-$2, and gasoline is about $2 a gallon. Well I'm still alive, but stuck for the moment in Puerto Natales in southern Chile. We just finished 5 very difficult days on the bikes. We got an early start on the Carretera Austral on Wednesday in slight drizzle - pretty typical I understand. The first day from Chaiten to Puyuhuapi was spectacular with snow-covered peaks and countless waterfalls. Puyuhuapi is a beautiful town with blooming flowers and fruit trees. We stayed in a nice old home (hospedaje) with a gorgeously manicured yard. The ride to Coyhaique the next day was even more awesome. It reminded me of a cross between southern Alaska and the Pacific northwest. There were jagged snow covered peaks with towering waterfalls and we stopped at the incredible hanging glacier, perched in a V at the top of the valley with a thundering river gushing from beneath it. I hope I got some good pictures. The weather today was excellent with sunny skies and warm temperatures. The road itself is quite challenging alternating between bumpy rocks, deep loose gravel, and smooth dirt (not much of the latter!). Quite a handful on a heavily loaded BMW making for slow going - we were only able to manage about 150 miles a day. From Coyhaique we entered Argentina at a forlorn border crossing. There was almost nothing in sight on the flat windswept pampas and the border officials seemed happy to have a couple of interesting motorcycles come through. I apologized for my poor Spanish but they assured me it wasn't a problem. We were stamped out of Chile in about 15 minutes and not much longer to be processed into Argentina! Each time the officials came out to admire the bikes and ask questions. I think they are very bored at this lonely outpost. Once in Argentina the road got worse and the national Ruta 40 was the worst yet - washboard, deep gravel and very slow. The first day we only made about 150 miles to Bajo Caricoles and about the same the second day to Tres Lagos. Both towns are not much more than a couple of houses and a small hostel to stay at, yet those were about the biggest towns we saw, and we encountered very little traffic in either direction. We did see lots of hawks, flocks of rheas (large ostrich-like birds) with their young and herds of guanacos (cousin. I examine my bike after each day to check for damage. Up to this point I had found a slightly leaking fork seal and a cracked front turn signal stalk which I repaired with duct tape and zip-ties. After all the pounding in Argentina I discovered a broken luggage mount - the same place I had broken it on the White Rim Trail. It's not a load-bearing mount but it keeps the bag from swinging. There wasn't anything I could do out here so I decided to continue on into Chile and the next big town of Puerto Natales where I could get it fixed. The third day in Argentina we rode in showers and strong winds. Sometime during the day I noticed a loud rattling coming from the front of my motor. Damn, that sure sounds like a timing chain! Again, there was nothing I could do until I could get to Puerto Natales to check it out. The racket seemed to get louder through the day. We reached the border late in the afternoon and reentered Chile with the same ease as we left. About an hour later we rode into Puerto Natales in the showers and stopped at a hostel to ask about a room. I asked the owner about parking for the bikes and the owner took us out and showed us his garage - a perfect place to check out my bike. The next morning I removed the broken luggage frame and showed it to the hostel owner. He said he could get it fixed so I left it with him. Next I disassembled the front of my motor to inspect the timing chain. 2 hours later when I finally got inside I didn't see anything wrong. The chain and sprockets looked good and the chain tensioner was functioning. I called Bill in BMW Denver service and he agreed it could be the timing chain, but he said I could probably ride it back to Santiago. Good news so I went back to the garage to put the motor back together. While reassembling the charging system disaster struck. Two copper windings in the stator broke because of my incompetence. Now I was really screwed. My bike had no charging system so there was no way to go anywhere in that condition. I had thoughts of putting the bike on the ferry back north and ending the trip. Instead I decided to sleep on it. Next time, the resurrection of my G/S. Well here I am stuck in Puerto Natales with a broken stator a thousand miles from the nearest BMW dealer. I called BMW Denver again and Clem said he would look into shipping me a new stator but that would take about a week. I imagined that I might be here for a while but that might not be too bad because Puerto Natales has all kinds of accommodations for tourists heading to Torres del Paine, Tierra del Fuego, and several glaciers. Kind of like when my rented BMW broke in the only tourist town in the middle of the Outback of Australia! At least I could spend the time enjoying the area while I waited. I encouraged Mark to continue the trip without me and I would catch up later but he's woefully unprepared to travel alone (he didn't bring a single tool for a 10,000 mile trip through South America!! !, despite my encouragement that we both be self sufficient) so he decided to wait a few days to see how my situation unfolded. I did get some good news when the hospedaje owner returned my repaired luggage mount. I had asked him to make the broken tab a little bigger, which he did and the welds looked good - all for about $4. We'll see if this holds for a while. We booked a bus tour of Torres del Paine, the nearby world famous national park. I tried to make several phone calls to people back home but I only reached answering machines. I also tried to send email from my Palm 3 from a local cybercafe but it failed to connect again. It's getting frustrating not being able to reach anyone and I hope they know I'm ok.
We got up the next morning and caught the tour bus minivan. There were 6 of us on the tour. Our first stop was the Cueva del Milodan, a cave where the well-preserved remains of an ancient milodan were found. Somewhat touristy but it was a pretty area. Next we headed into the park. As we got closer the famous towers got bigger and bigger. The mountains and spires are quite impressive covered with snow and glaciers. We were lucky to have a beautiful morning with blue skies and a stiff wind. The scenery in the park kept going on and getting better - mountains, rivers, lakes, glaciers, and forests. We saw (and fed!) gray foxes, tons of guanacos, rheas, and condors. We hiked a short distance to the top of a thundering waterfall with a stunning view of the famous 'Horn'. After lunch we hiked to a lake full of icebergs fed by the glacier visible across the water. Torres del Paine is quite a spectacular park and I would like to spend more time here. I also had some time to think today and I'm more optimistic about the trip. Part of the challenge of these long adventures is staying up both physically and mentally. Today I'm more determined to finish the trip. In the morning I'm going to remove the stator and see if I can find someone to fix it. After removing the stator the next day I showed it to the hospedaje owner to see if he could help me out again. He said it was no problem to get it fixed today and took the broken stator. For the rest of the morning I did some shopping and wrote some postcards. Late in the afternoon the owner motioned for me to come with him and we drove in his minivan to a small workshop. Inside a couple of fellows showed me my repaired stator. They had unwound some of the winding and soldered the broken wires, then reassembled everything with fresh insulators - very professional looking but hard see how sturdy the repairs are. I think they were impressed when I pulled out my pocket multi-meter and verified the connectivity and resistance - almost like I knew what I was doing! I paid them the whopping fee of $7 and we headed back to the garage. 30 minutes later the stator was installed, I fired up the bike and my charging system was working! I was back in business. The owner wouldn't take any money for all his help so I bought a small box of chocolates for him and his family. We prepared our stuff to continue south in the morning. Yesterday we made it to Fin del Mundo - the end of the world! We left Puerto Natales and rode south to Punta Arenas in strong winds, heavy rain, and occasional snow pellets. I was pretty chilled after the 3-hour ride. The next morning the winds had increased. We rode to a gas station before getting on the ferry to Tierra del Fuego. I removed my gas cap and as I was reaching for the gas nozzle the wind blew my bike right over. Gas was pouring out of the open gas tank so I rushed over and screwed on the cap. With the help of several attendants we got it back up without any signs of damage. The first mishap of the trip. We rode the short distance to the ferry dock. When we got there the wind was blowing so hard there was no way to safely park the bike. Parked leaning into the wind it was getting blown right over, and parked the other way it was getting blown up and over the sidestand. Eventually I parked it as best I could and went in to buy the ferry ticket. From the line inside I watched the wind nearly blow the bike over several more times. After we got our tickets we had to load onto the ferry - an adventure itself because the loading ramp was exposed and the wind was blowing spray all over it. I thought I would get blown right off the ramp and into the Magellan Strait, but with a little momentum I rolled up the ramp and into the boat. Once on the boat the ferry crew threw us some rope and we had to secure the bikes ourselves. We tied them down good expecting a rough ride but not sure just how bad it would be. The 3-hour ferry ride did get pretty rough with strong wind and 4 foot seas but the bikes were ok.
Once onto Tierra del Fuego we rode to the Argentine border and crossed without incident. The ride was very strange because we had a tailwind faster than our forward speed. It was eerily quiet with no wind pressure even though we were riding at 50 mph. The next morning as I was gassing up for the run to Ushuaia I met 2 Brazilians riding R1100GS' coming back from Ushuaia. They warned me about the cold and wind and tried to convince me to ride to Brazil with them but I explained that I had to get to Ushuaia first. We headed south with more or less a tailwind and arrived in Ushuaia 3 hours later. We made the ride out to the end of Rt. 3 - the most southerly point in the world that can be driven to - for the obligatory photos. It has been a goal of mine for some time to ride to Ushuaia and I had a nice dinner in town that night to celebrate. I visited the souvenir shops in the touristy downtown area to get some mementos. Now it was time to get off this windblown island and head north up the Argentine coast. I just spent the past week travelling up the east coast of Argentina. What a windswept wasteland! We left Ushuaia early in the morning with temperatures below freezing and a stiff wind (surprise!). The gravel road north was very bad and we only made it to a small oil town on the north coast of Tierra del Fuego that night. We stayed in a barracks that must have been used to house oil workers in better times. After we unloaded another rider on a Suzukl 250 with hard bags pulled in. I introduced myself to the Japanese rider who was doing an around-the-world tour. He had started in Vancouver and had traveled north to Prudhoe Bay then all the way south to Ushuaia. He was heading north to Buenos Aires like us so we hooked up and rode together for the next 5 days. 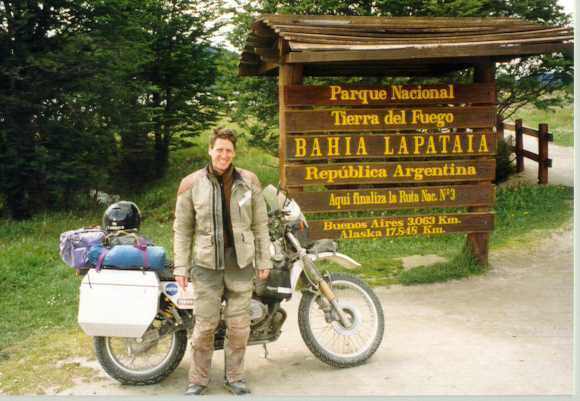 The next day we caught the ferry off of Tierra del Fuego and continued north on a combination of dirt and paved roads. The next 3 days were pretty much the same as we rode north with a stiff crosswind and flat scrubland for as far as you can see. The only change was that the temperatures kept climbing until it was close to 90 during the afternoons. On the 3rd day we reached the Valdez Peninsula, a national park and wildlife preserve. We decided to spend an extra day here and explore. We saw elephant seals, guanacos, hawks, and penguins (!). We didn't see any Orca whales, which frequent the bays in the fall. Since we spent an extra day on Valdez and we didn't feel like we had time to visit Buenos Aires (a city of 13 million) and do it justice, Mark and I decided to head straight to Mendoza to try to find the BMW mechanic I had heard of and have some work done on the bikes before heading north to Peru. We said goodbye to Seizo who was going to skip Buenos Aires and head to Brazil. Later in the morning I came upon Mark parked on the side of the road. When I pulled up he said that his trip was over, that his gearbox was screwed up and would barely shift. We used my tools to check the gear oil. There was plenty of oil but it was full of metal shavings. We limped to a gas station where we found a truck driver willing to haul Mark's bike to Bahia Blanca (for $130) to try to get it fixed. I gave Mark all the information and we agreed to try to communicate via our home answering machines. Mark was having a hard time this trip and never seemed to get into it mentally. I suspect he's not too motivated to continue the trip and will ship the bike home instead of trying to get it fixed and catch up. I continued north alone and 2 days and 1,000 miles later I rode into Mendoza. vegetarian food of the trip. Yup, I think I like Mendoza. The next morning I went to the mechanic's shop. He had about 20 bikes in various states of disrepair, mostly BMWs but with an old Indian and a Royal Enfield thrown in. Together we changed my oil and filter, checked all the oils, adjusted the valves, set the timing, synced the carbs, cleaned the air filter, tightened the right header pipe (the source of the rattle that I heard way back in western Argentina), and tightened and torqued various other things. The mechanic agreed that the timing chain was noisy and should be replaced when I get home but it should be ok for the rest of the trip. All this work took most of the day and cost $145 for labor and parts (2.5 quarts of oil cost $22! ), a bargain by US standards. The bike is running so sweet now! It starts right up, idles and runs so smoothly, I can't wait to head north. The next morning I didn't feel like hanging around Mendoza for the whole day until the BMW club meeting so I headed out of town towards Santiago. The road west climbed into the foothills, then into the real mountains. The road was curvy with great views of huge snow-covered peaks. Finally I was riding in the Andes! The border crossings were at the highest point on the road, about 11k feet, where it was very cold. Immediately after Chilean customs the road descended quickly in a series of 32 (each numbered!) hairpin curves. The temperatures climbed until it was over 90 degrees as I dropped into the valley. I decided not to go into Santiago, but instead to call my bike shippers from north of the city to make sure they would be ready when I returned from the north. I was able to reach Soledad with no problem and she said they would be ready when I returned and wished me a good 2nd trip. I immediately turned my bike around and headed north. The first loop was successfully completed and now I begin the second! The past 3+ days I've spent riding through northern Chile. Just north of Santiago the land is still green with some farming, but soon the terrain gets rocky and barren. In places it looked like a lunar landscape with huge boulders and very little alive. The highway is paved and mostly in good condition, but it negotiates many steep hills and curves making it necessary to pay attention. The road runs along the coast here making for some good views of the waves crashing on the rugged beach and the occasional seaside resort. I stayed one night in La Serena, a bustling town with something like 29 churches, some dating from the 16th century. It was a couple of days before Christmas and the crowds were out doing last minute shopping, mostly locals it seems, as in the rest of South America I've seen few tourists. North of La Serena the landscape changes again as you enter the Atacama Desert, the driest desert in the world. Vast expanses of sunbaked clay and rock with huge sand hills. There's almost nothing alive. I've seen no reptiles, rodents, or even insects, and almost no brush or grass. Even the Outback of Australia looks like the Garden of Eden compared to the Atacama! Quite desolate yet beautiful. There are signs of life though. Today I saw many ancient petroglyphs, artwork (messages?) carved into the huge hillsides and some pueblo ruins and amazing old cemeteries in the middle of nowhere. The are a couple of towns and even cities along the way, established mostly because of the rich mineral resources. It's strange to ride for hours through empty wasteland and then come upon a large city with skyscrapers and traffic. Both Antofagasta and Iquique are located on the coast but the desert runs right up to the water here. It's an amazing sight as you enter Iquique to come over the hill and see the sprawling modern city surrounded by huge sand hills. During a conversation with a gas station attendant yesterday he mentioned that Chile has it all - mountains, glaciers, rivers, and desert. In addition the people have all been polite and friendly. Quite an amazing country! Very soon I enter Peru to see what it has to offer. Feliz Navidad! I crossed into Peru at the Arica-Tacna border. It was the most difficult border crossing yet with each side requiring several forms, but I was through into Peru in about an hour. It was obvious as soon as I crossed from Chile that Peru is a much poorer country, as seen in the people's clothes and the towns. Because of this things are very cheap - I had a 4-course lunch the other day for about $2 and I paid about $2.75 for a room! I rode for about 4 more hours to Arequipa where I found a nice hotel. I decided to stay here an extra day and rest since I was really beat and I had several difficult days coming. Arequipa is a cool city with many colonial buildings and an amazing convent (I have pictures!). After my rest day spent exploring the city I headed into the Andes. My first stop was 5 hours away at the Colca Canyon. As the road climbed into the Andes it became very bad and the going was slow. The road climbed very steeply and eventually crossed a 16,200-ft pass! After that I dropped down into the town of Chivay at 12,000 ft and the start of the Colca Canyon. The canyon is very deep with spectacular scenery and you can often see condors. I did a little exploring of the canyon in the afternoon but I didn't see any condors. That night I met a couple visiting the canyon. Enrique was originally from Lima and had worked as a guide in the Cusco area and he gave me a few tips over a beer. The next day I had a long way to go on some bad roads so I got an early start. My maps didn't clearly show the way to go but the locals insisted there was a 'good' dirt road that went to Cusco so I headed in that direction. The road was terrible and I spent much of the day in first gear. The scenery was spectacular as I crossed 4 more passes higher than 15,000 ft. I got a couple of snow pellets and some rain showers but nothing too severe for the rainy season. About 10 hours later I rode onto the paved road to Cusco. It felt so good to be off the rough dirt and out of 1st gear! The next day I arrived in Cusco early and found a nice hotel with a private bath for $20/night. Cusco was the capital of the Incan empire but it was captured by a handful of Spaniards in the 1500s. Over the next 4 days I took several guided tours and explored the city on my own. It contains a fascinating mix of Incan, Spanish, and modern architecture, with many of the modern buildings built on top of Incan foundations. However, the city is very unsanitary and the smell of urine and feces is overwhelming on some streets. The crown jewel of the Cusco area is Machupicchu which is thought to have been a sacred Incan city, and is one of the only Incan cities not discovered and sacked by the Spaniards. It's built high in the jungle with rain forests towering all around. The ruins are fascinating and beautiful. I finally saw 2 condors soaring over the mountain peaks. It truly is a mystical place. Cusco and Machupicchu had been another big goal for my trip but after 4 days it was time to move on. I headed south towards Bolivia on the last leg of my trip. I got sick the morning I was leaving Cusco - nausea, stomach cramps, diarrhea. Peru in general and Cusco in particular are the most unsanitary places I've ever been and I figured if I was going to get sick it would be here. I was not looking forward to the ride to Puno because my guidebook said that the road was bad dirt and impassable when wet. I was pleasantly surprised to find that the whole thing had recently been (or was being) paved, which was good as badly as I felt. When I got to Puno all I could do was lay down for the rest of the afternoon. I was very sick for the next several days, unable to eat anything and only able to ride a little, rest, and ride some more. This lasted for all my time in Bolivia. I was able to visit the pre-Incan ruins at Tiwanaku but didn't feel well enough to go into La Paz. The ride from La Paz to Arica was spectacular across the high altiplano (13,000+ ft) with towering volcanoes, glaciers, vicunas, and vultures. Finally I was back in Arica which I had left 2 weeks ago. I started feeling better a couple of days after returning to Chile. I headed south through the Atacama and took a side trip to San Pedro and the geysers at El Tatio. The geysers mostly spew steam and aren't as impressive as the ones at Yellowstone, but the geyser field is in a high valley surrounded by high and active volcanoes making for a surreal setting. From San Pedro I went back to Antofagasta where I met a family of expatriate Americans living in Bolivia but on vacation with their 4x4 and his R100GS. They gave me lots of tips about Latin America over dinner and a beer (my first in about 9 days after being sick!). Next I went to the beach resort at Tongoy where I relaxed for 2 days. I only had one travel day to return to Santiago and finish my adventure, and in Tongoy I celebrated and reflected on my trip. My final day of riding from Tongoy to Santiago was only 300 miles but most of it through construction. It was frustrating after 8 weeks on the road to be battling traffic and construction on the last day. Finally I rode back into Santiago. Funny, the Santiago traffic didn't seem as bad as when I left 8 weeks ago! With the help of my GPS I found the hotel we had stayed at earlier and where I had left my airline bags. I unloaded the bike and parked it in the parking garage across the street. The next morning I called my bike shippers and headed over there to arrange shipping. I gave them all the documents they needed and they assured me there would be no problems. They arranged for me to go back to the garage and crate the bike that afternoon. First I went to the United Airlines office and moved my return flight up a few days to Sunday night since it looked like everything would be finalized early. I headed out to Maipu and crated up the bike then took a cab back to the hotel. I got back at 4 on Friday afternoon and there was a message from the shippers. I called them and they said there were more forms that needed to be filled out but it was too late to do it today so I would have to come in Monday! I explained that I was leaving Sunday but they insisted I would have to come back Monday. After 2 months I wasn't going to be stopped by this so I went to their office and within a couple of hours we had the paperwork done and my bike was gone! Now that my bike was gone I just had to get on a plane and head home. I celebrated the successful completion of my trip with a bottle of Chilean champagne. For 8 weeks I had kept my bike running for 10,000 miles over some very bad roads in 4 countries. This trip was easily the most difficult I've attempted but this added to the tremendous sense of accomplishment. Several days later I was home after a painful day of flying. My cats ran away and hid in the basement when I got home but it was still nice to be back. For several days it was quite a shock being back trying to catch upon work. Several times I woke up at night and had no idea where I was until I realized I was in my own bed! I'm extremely fatigued after my long trip and can't even begin to think about what my next adventure will be, but I promise to let you all know when I figure it out! FYI, I just received this message from Story. I just got back from South America. What a trip! In all I did almost 10,000 miles in just under 8 weeks. I visited 4 countries - Chile, Argentina, Peru, and Bolivia. The roads were really bad in places - lots of washboard, potholes, and deep gravel. No problem on our XRs, but quite a chore on an overloaded BMW! Even with the bad roads the G/S did amazingly well. A slightly leaking fork seal, a broken luggage mount frame, and a loose header pipe. Not too bad for an 18 year old bike. I guess all that preparation I did before the trip really paid off. The front forks were my biggest disappointment. They are puny with lots of flex and stiction causing a harsh ride on the rough roads. Also, they flex so much that the fork seals leak and some oil gets forced out the top. I'm going to look for a set of good forks (Marzochi?) that I can graft onto the Beemer (I saw a G/S in Argentina with this modification - quite impressive). Hopefully we can get together sometime and I can tell you more about the trip. I took 15 rolls of pictures so I hope to have a few good shots. Thanks for the information about this year's Swell ride. I think I'd like to try to join you this year but I'll have to let you know a little later. Things are a little crazy right now having just gotten back but they should be better and I should have a couple of vacation days by May. I'll monitor the trip status on the Moab mail list. Talk to you later.